Since starting to receive ADS-B signals on 1090MHz I was wondering how well my home made antenna was tuned to that frequency. 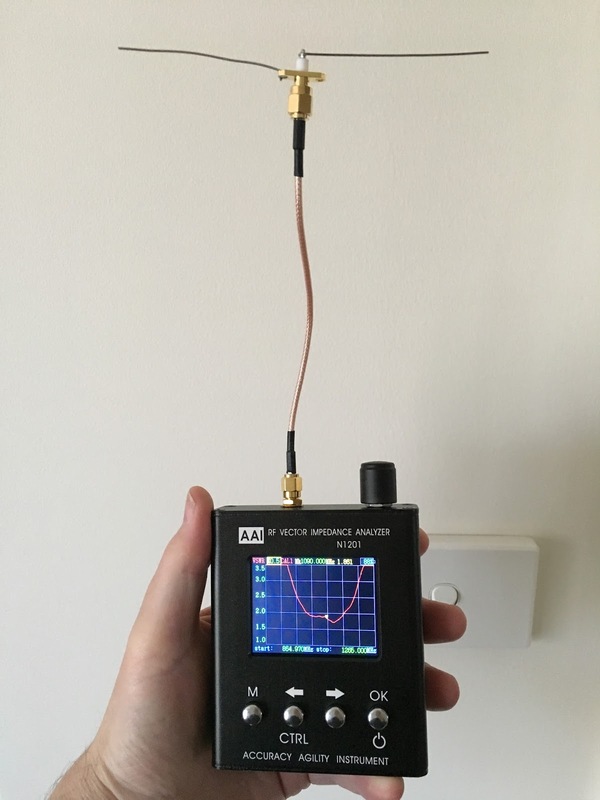 I spotted an analyser for AU$236 that covers up to 2.7GHz on Aliexpress here and it seemed worth a try. Here it is with a simple dipole that is reasonably tuned to 1090MHz. 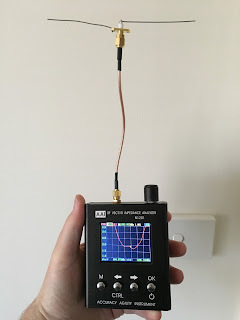 It's advertised as "Antenna Analyzer N1201SA SWR standing-wave meter Talent instrument Impedance tester 140M~2.7GHz" and I'm very happy with it. The unit contains a re-chargeable battery and is simply re-charged with a USB cable. The knob at the top makes it easy to tune the lower and upper range frequencies. 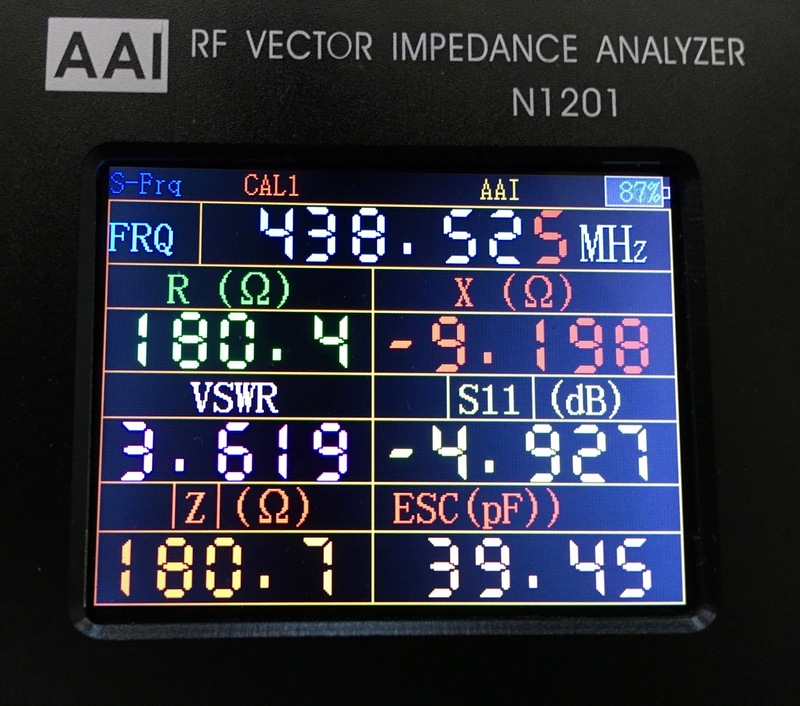 Output level is -18dBm and it seems on frequency as far as my UHF transceiver is concerned. There are two modes, one with figures displayed and the other which draws a graph as you see above. If you need to work in the GHz range, I recommend this little analyser. It turned out my home built antenna for 1090 was a little low and resonant at 1083.3 - not too far off. Hi Peter, thanks for the post on the N1201SA. Your blog is pretty much the only page on the web I could find which had both decent photos and writing in native english. How are the menus and configuration for this device? I'd like to get one but I'm a bit worried about them being obscured behind Chinese characters. I know it's only a single port device but would it be possible to also test filters with the use of a directional coupler or something? 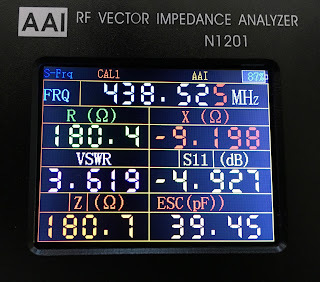 Prior to finding out about the N1201SA I had been thinking of a PocketVNA ($430) which is a much more capable two port device but the price tag is a bit beyond my range. Menus and use of the device are quite easy to figure out. There isn't Chinese characters visible in normal use. As you say it's a single port analyser so a MiniVNA or similar would be better for filters. It's also great that this device charges from USB and the battery life is good. I recommend it.